How does one react to something like this? What does one feel? When people ask me do you love your country, I usually don't have an answer. I am not sure what it exactly means. But today I am certain of this: I would never want to bring a child into this country, where an apathetic government showers empty platitudes after every attack but does nothing to ensure one's safety. 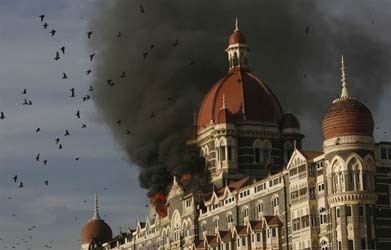 As I watch Bombay burn, for 60 hours after the mayhem started, I am extremely worried for the future of this country. It makes me wonder where we are headed as a nation, as people. What does it take for someone to wake up one morning and decide, today I am going to kill people? How does one get out of the house and bid goodbye to the family, not knowing if one will ever come back again? When I was growing up I remember some kind soul tell me, "Try to live each day as though it were your last"; we don't even have to try any more, do we? Tomorrow we will talk of the indomitable "Mumbai spirit", the never-say-die attitude; I wonder, is it really that? Or do we really have a choice except to go on living, from one terrorist attack to another? That is what life has become in this country, hasn't it - a few shared moments with family and friends before another attack like this strikes again. We call up our near and dear ones, assuring ourselves that everybody we know is safe - yes, at the end of the day we are all selfish; I wonder, however, how long it is before misfortune strikes even closer home. Bomb blasts, terror attacks - these have become a way of life. I am upset because that isn't how it is supposed to be. Children in this country don't have to grow up worried about death; they are supposed to have parks to play in, gardens to walk through, a life of innocence. This is not how it is supposed to be. This is not the future they should wake up to. I am angry at an impotent government that "condemns the attacks" every time, "resolves to fight against terror" yet does nothing on the ground to combat it. Why is it that if the government had information such as this, nothing was done to prevent what happened? I wonder why there has been no terrorist attack in America since 9/11, but our country has witnessed many "such incidents" (that is what they are, isn't it) in this year alone. I am angry with the politicians who immediately make a beeline to the "sites of tragedy", offering their condolences. Why doesn't someone tell them we don't need this? Their shallow gestures are of no use to us. What we need is for them to act, not react always. I am angry at how the Indian media loves a situation like this, how insensitive our reporters are asking a son waiting for information about his father trapped inside or a husband who has lost touch with his wife since 2.30 AM yesterday morning, "how do you feel"? What kind of a question is that? How does one feel? How does one cope knowing someone you love may never walk out of all this alive? I cannot also understand why the media is not barred from reporting what the police are planning to do. Doesn't that mean the attackers themselves have ready access to information, one that helps them plan their strategy? Most of all, I am just tired: tired of asking why, of wondering when will all this end?